Spent Last Winter With Daughters Here. Mrs. Mary Aderman of Altamont, mother of Mrs. Henry DeJong and Mrs. George Smith of Springfield, died at 1:50 p.m. Thursday at her home. She was 76 years old. Mrs. Aderman was a lifelong resident of Altamont. A frequent visitor to Springfield, Mrs. Aderman spent last winter at the home of her daughter, Mrs. DeJong, 1225 East Brown Street, and has many friends in this city. Survivors, besides her two daughters in Springfield, are two other daughters, Mrs. Cecil Bridges and Mrs. Leonard Yocum, Detroit, Mich.; four sons, Wilbur, Altamont; Carl, Daggett, Mich.; Theodore, Mt. Pulaski, and Paul, Lincoln; one sister, Mrs. Ernestine Rath and one brother, Fred Heiden, both of Altamont. Funeral services will be held tomorrow afternoon at the Immanuel Lutheran church in Altamont, where burial will be made. A grand lady and mother has passed her last, her 76th milestone on her pilgrimage through this world. 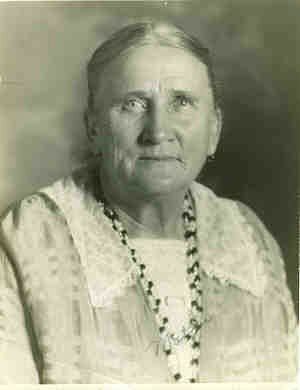 Mrs. Mary Albertine Adermann, nee Heiden, started out on the roadside of life at Bethlehem, February 11, 1863. An important incident in her pilgrimage was her reception into the household of God through the rite of Holy Baptism which was performed by Pastor Kanold. After attending the parish school of the Bethlehem congregation for a number of years, she renewed her baptismal vow under the pastorate of Rev. G. Wangerin, March 25, 1877. Continuing on her way, she met a young man who was to become her companion and the shares of her joys and sorrows. To this young man, Mr. Ferdinand Adermann, she was joined by the bands of wedlock through the ministration of Pastor Gruker at Bethlehem, October 19, 1882. At Altamont the young couple established their stopping place. Twelve children, seven daughters and five sons, were given them to adorn their home. While residing in Altamont, the parents enjoyed not only days of sunshine but they also had to pass through waters and rivers of sorrow and walk in the midst of fiery flames of trials. Three daughters and one son were taken from them by the grim reaper Death; Yea, the marriage tie itself was severed, when Mr. Adermann was called to his heavenly home, January 5, 1927. While in Altamont, Mr. and Mrs. Adermann made Immanuel congregation their spiritual home. Both remained faithful and conscientious members of the household of faith until God called them to the rest in store for the people of God. Mrs. Adermann was called to the Heavenly Jerusalem June 27, at 1:45 p.m. Prof. G. Herman Beck of St. Louis served as organist at the new organ which had been dedicated in the morning service. Mrs. Adermann was laid to rest in Union Cemetery. Her absence will be deplored by her four daughters; Mrs. Henry DeJong and Mrs. Geo. Smith, of Springfield, Ill.; Mrs. Leonard Yocum and Mrs. Cecil Bridges of Detroit, Mich. And by her four sons; Carl of Daggett, Mich.; Theodore, of Mt. Pulaski, Ill.; Paul of Lincoln, Ill,; and Wilbert, of Altamont, and by her grandson whom she reared from childhood, Harry Durheim, of Jackson, Miss; and by her sister and brother: Mrs. Charles Rath and Mr. Fred Heiden, of Bethlehem; and by her 25 grand-children, and by her 16 great grand-children. Memorial wreaths to the amount of S$9.75 and many beautiful floral offerings have been made by relatives and friends and neighbors in kind remembrance of Mother Adermann.